Next to Rome, the city of Ephesus was a great religious, commercial, and political center of Asia. There were two notable structures in Ephesus: (1) the great theater which had a seating capacity of 50,000 people; and, (2) the temple of Artemis (also known as the Greek fertility goddess, Diana) – which was one of the seven wonders of the ancient world. This is important to know going into chapter 4 because Paul is going instruct us how to act. Ephesus was a busy place, and there was an overload of idol worship and pagan practices. We don’t need to look around our streets or thumb through social media too long before realizing folks don’t know how to act. I think we could all afford a lesson in how to behave in a corrupt world. 1As a prisoner for the Lord, then, I urge you to live a life worthy of the calling you have received. 2 Be completely humble and gentle; be patient, bearing with one another in love. 3 Make every effort to keep the unity of the Spirit through the bond of peace. 4 There is one body and one Spirit, just as you were called to one hope when you were called;5 one Lord, one faith, one baptism; 6 one God and Father of all, who is over all and through all and in all. - Right off the cuff, Paul offers us perspective by saying, “…live a life worthy of the calling you have received.” He called our attention to the work of Christ in chapters 1-3, and now he compels us to live a life which outwardly values and displays the sacrifice of Christ. Life’s trials and circumstances can often paralyze us, but a godly perspective releases our self-focus and gives us a God-focus. - “Be completely humble and gentle; be patient, bearing with one another in love.” This is a tall order for a dozen words! How can we have this divine disposition when our natural tendency is to be proud, brash, snappy, and judgmental? We must come to study, seek, and genuinely know the humility of Jesus. He was (and is) the ultimate example, humbly pouring His life out – to the point of death. Let’s sink down into this truth each moment and believe that Christ has given us everything we need for a godly life (after all, we’re told this truth in 2 Peter 1:3). - Paul speaks extensively about unity and oneness. For a body to physically move forward, it can’t travel in opposite directions. Yes, we’ll have differing opinions and stances; and, while we may not always have consensus on certain topics, we must always have commitment when it comes to His Word. The church today errs on the side of consensus building instead of commitment building. This is what Paul is emphasizing in verses 3-5: we are one. One Lord, one faith, one baptism, one God and Father of all. Be committed to keeping Him as the One who is over all and through all and in all. If everyone can commit to this, there will be a bond of peace. - This is a meaty section, so let’s thinly slice it into pieces and chew on it slowly. In verse 7, it’s explained to us that Christ gave each of us the gift of grace. He didn’t give you two cups and me three. He gave each of us an equally measured portion of unmerited favor that we did not deserve. - Verse 8 quotes Psalm 68:18, and it speaks of the victory we have in Christ, and the gifts He gave to us from that victorious battle. What were those gifts? It tells us in verses 11 and 12: prophets, apostles, evangelists, and pastor-teachers. These were Christ-established “offices” and not given at the discretion of man. While man may often try to assume these positions, in God’s economy they are not earned or ambitiously pursued, but given to the humbled. - The purpose these four roles is “to equip his people for works of service…” The work of the ministry comes from God’s people (that’s you! ), and the leaders in the church have the responsibility to equip people to serve and to direct their service as God leads (Guzik). - Bottom line: grow up, speak up, build up. We are to grow up through the teaching of God’s Word; truthfully speak (proclaim) His truth, and be built up in the body of Christ as we do our work. - Remember how the first three chapters of Ephesians was on the work of God and the heavenly? Paul is saying here (if he spoke modernly), “For real people: don’t act like the pagan folks. Seriously!? They are wicked and they have no idea what God is about or what He did for you. They are broken, desensitized, and in love with themselves. Don’t go there. That’s not what you learned – you know better!” Paul goes on to instruct us that we are to put off our old self – that pagan way we once followed – and to be made new in the our thoughts. Aren’t you glad the Lord is in the renewal business? o Don’t sin in your anger. (It’s okay to be angry, just don’t let it manifest negatively). o Work hard! Have a solid work ethic and earn what you are given. o Build others up. Speak encouraging words that edify. o Be kind and compassionate. I should’ve gone directly to God in prayer and allowed Him to give me a better perspective. 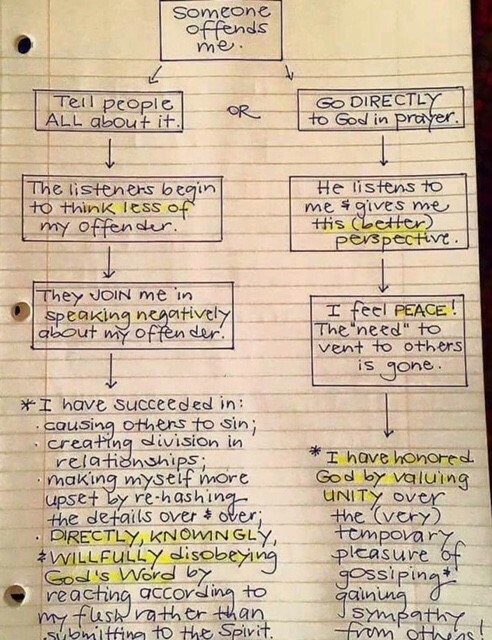 I didn’t honor God by valuing unity over the temporary pleasure of gossiping to gain sympathy from others. I was wrong, and I learned from that. I’m sure you have examples of this, just like me. We’re all a work in progress – praise God for His perfect measure of grace. Amen.